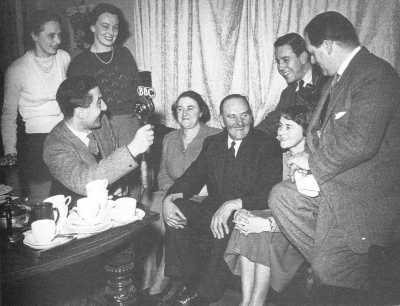 Richard Dimbleby (right) and his producer John Shuter (behind right) at Southfleet, Kent, interviewing the pub landlord of the "The Ship" Mr. and Mrs. George Clinch and their 3 daughters. Originally presented by Stewart MacPherson (from 1946 - 1950) , then Richard Dimbleby (from 1950 - 1955) followed by Franklin Engelmann and in 1972 by Brian Johnston, visited villages and towns in the British Isles and interviewed colourful local characters, then invited them to choose a piece of music. The unchanging format, with its staunchly patriotic signature tune of 'Horseguards, Whitehall', was a feature of Sunday teatime listening for almost forty years. The first programme was broadcast on 29th December 1946 from Lambeth and the featured guests were a rabbit seller; a Covent Garden porter; Mr Hill, a Herbalist; one of the directors of The Young Vic and Mr. Monty Modlyn, a Lambeth character who was later to become a popular broadcaster. Each week the programme usually interviewed someone with an unusual title to their job such as a "fluffer" (a London Underground tunnel cleaner), a "white hot rivet catcher" at a Newcastle shipyard, and including a Bradford family whose window sign advertised their occupation as "family rat catchers authorised by The Ministry of Food". Throughout this recording, the family each held one of the ferrets they used for their job. Richard Dimbleby's one request was "Please don't ask me to hold them!". The original producer was Leslie Perowne followed by John Shuter from 1947 to 1952.